Do you want to know when your MP Vyapam Supervisor Admit Card 2017 has been set to be declared? In other words, are you aware of the date on which the Hall Ticket will be out for the exam (Female) scheduled to be held on 25th and 26th March 2017? If you are curious to know, we will share all important news with you. Just you need to continue reading this page till you reach the end of the same. As far as MPPEB Mahila Paryavekshak Admit Card 2017 is concerned, it has been announced and a direct link to download it is now avilable below. We know that you had submitted forms for the vacant posts of Mahila Paryavekshak and Anganwadi Karyakarta. The total of both posts is 714 and it is further divided into 2 parts equally i.e. 357 posts are for Mahila Paryavekshak and other 357 posts are meant for Anganwadi Karyakarta. Continue reading and also visit the official website at www.vyapam.nic.in. Latest News: Test Admit Card for Directorate of Akikrit Bal Vikas Seva Recruitment Test 2017 (Including Mahila Paryavekshak and Paryavekshak Mahila Aganwadi Karyakarta) for the Online Examination has been uploaded on the site. You can use the direct link at the bottom to download it. To get it, you will need your “Application No. (Max. 13 digits)” and “Date of Birth” as in the format of “DD/MM/YYYY” and then click on “Submit” button. The exam will be conducted in two shifts. In the first meeting, the exam of Female Supervisor will take place, whereas, in the second shift, the Anganwadi Karyakarta Exam will be organised. The exams will be conducted on Saturday and Sunday. You will have to make sure in which your exam is scheduled. This can be done by downloading the admit card from the site. The time of 1st Shift is 9:00 AM to 12:00 PM and timing for 2nd Shift is 2:00 PM to 5:00 PM. The total makes that single exam carries are 200 marks which mean both carries 400 marks. A few days ago, Madhya Pradesh Professional Examination Board (MPPEB) had posted an advertisement to fill up empty jobs of Mahila Paryavekshak (Female Supervisor) and Anganwadi Karyakarta (Anganwadi Worker). Total vacancies published in the notice are 714 against which attentive postulants had applied until 7th March, however, the date to make correction in the form is still 12th March. Before you go to attend the exam, ask yourself the question “Am I ready to appear for the exam?” This will make you realise how prepared you are to sit in the exam centre. That is why considering the exam syllabus can help you score good marks in the test of the above-mentioned posts. Check out how many marks does the exam carry and from which questions are going to come in the exam. Make sure the base of the test and also know if it is based on Objective Type questions or not. You must not forget your MP Vyapam Female Supervisor Admit Card 2017 at home while leaving for the exam. This will make the chances of your disqualification in the exam. Not only in this test the security will be tight but in any exam invigilators are there to keep an eye on the candidates. It does not mean that they will not help you if you need any. If you get stuck in the beginning, you can freely ask them to make it easier for you. The test is based on “Objective Type” questions, which means for every question, there will be 4 options out of which you have to pick the right one. The exams will be organised at different centres which are Bhopal, Indore, Jabalpur, Gwalior, Sagar, Ujjain, Sidhi, and Satna. Also, grab the details of the exam centres through the image below (If you cannot see the image, make sure you have turned off the ad-blocker). The mode of exam is online i.e. it will be a CBT (Computer Based Exam) and only those aspirants who possess MPPEB Mahila Paryavekshak Hall Ticket 2017 will be allowed to be eligible for it. Some important instructions are what every applied contestant must follow to get the best of this Online Test. So, what the important points that you must follow? We have made a list for you to easily understand what you should do when it comes to “Appearing for Online Test on 25th and 26th March 2017”. You have to reach the examination centre before 1:30 Hours of the exam commencement. Through the Biometric System, the Thumb Impression of the candidates will be taken since it will be required later. So, only those who give their thumb impression will be able to sit in the CBT. On MPPEB’s website, there is also the facility of “Mock Test” which candidates can take advantage of in order to do some practice before the exam. To appear for Online Test, you must have Identification and Password without which it is not possible. So, it is highly recommended that all postulants keep this information safe and private. At the time of appearing for Online Test, you must carry MP Vyapam Anganwadi Karyakarta Call Letter 2017 with you, otherwise, you will not be able to participate in the CBT. Apart from Call Letter, you must have “Original Voter Id” as it is mandatory to sit in the exam. Those who enter the exam centre after 30 minutes of the commencement will not be entertained. First off, log on to the authorised panel of the Official Website, which is “www.vyapam.nic.in”. There, you will see many notifications, click on the proper link. Then, get to the “Admit Card” link of your applied post i.e. Mahila Paryavekshak/ Anganwadi Karyakarta. Enter all asked details carefully and press the Submit button to save. Finally, get your Exam Admit Card and take it to the centre on the exam date. 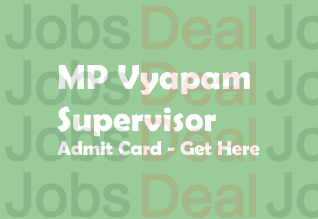 If you feel any uncertainty about MP Vyapam Supervisor Admit Card 2017, let us know via the comments below. Keep visiting this page to know about upcoming updates on answer key and result.